The Giants have been tinkering with what the propeller-heads like to call "dynamic pricing" — raising or lowering prices depending on variables like weather or pitching matchups. Where I'm from, we just call this "scalping." Many teams have various ticket prices for the same seats, altering the dollar amount based on the opponent, the day of the week and the time of the year, but those variations are set before the season and not altered. The Giants, by being more fluid, are taking the concept a step further. 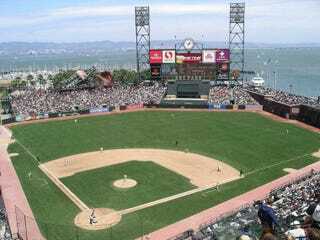 On Saturday, with Johan Santana paired against Randy Johnson, the Giants raised the price of bleacher seats [normally $17] to $33, including a $2 increase on game day; seats in the upper deck [normally $10] were again $19. On Sunday, bleacher seats went for $23 and sold out in a few days because Lincecum bobblehead dolls were given away. Through the first 17 home games, sales of dynamically priced tickets rose 20 percent, compared with sales in those sections during the same period last year. That works out to about 500 extra tickets a game. The ticket-price populists out there will squirm a little, but it's a fascinating idea (one that the reliably nerdy A's were planning to implement in their new ballpark, which now exists only in Lew Wolff's fever dreams). If it catches on, there might come a time when fans can upgrade their seats instantly or gorge themselves more cheaply on days that hot dogs are in long supply. The fact that this shrewd bit of business comes from a team paying Barry Zito $18 million a year makes it all the more surprising.